Density is a contentious topic in Vancouver. The population is growing. There’s a housing crisis. The city appears in both the world’s “Most Liveable” and “Most Unaffordable” lists. Vancouver’s postcard beauty and “super natural” setting attracts growth but also limits it. 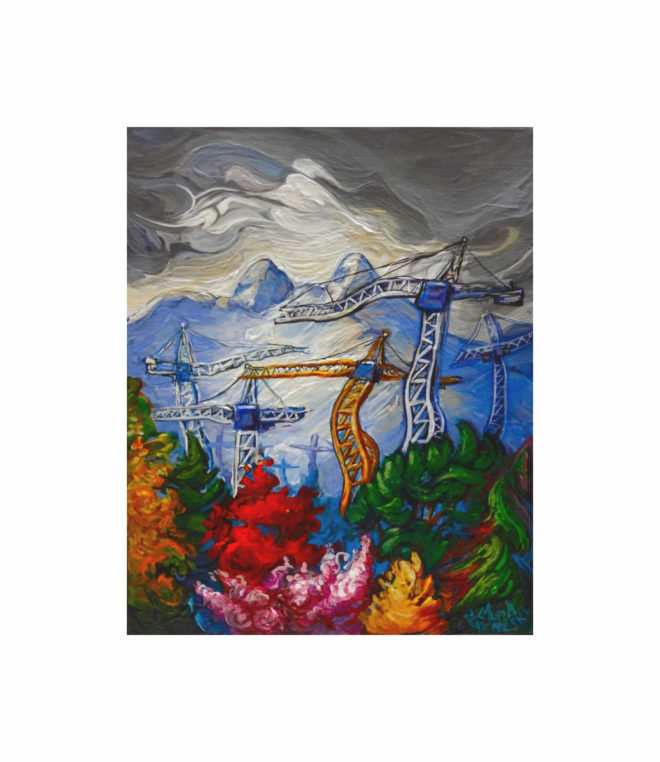 As the cranes multiply along the skyline, Vancouver’s natural setting will be forced to change. Culture will always determine how we see nature but nature doesn’t change as swiftly as neighborhood culture does. Maybe that’s a good thing. Sadly, the show’s venue is closing March 31, 2017, due to (among many other reasons) unaffordability. Affordability and community sustainability was kinda a big theme in my Inhabit the Contradiction series. And so it goes. Hello! Could you please send me a price list of your available works? I also like “Mirage” and “Coal Harbour Sunset,” but would consider other pieces as well. I’m a former Vancouverite who got chased out by the cost of living, but would love a reminder of its beauty. Hi Riann – sent! Thanks. I totally know what you mean about the cost of living.